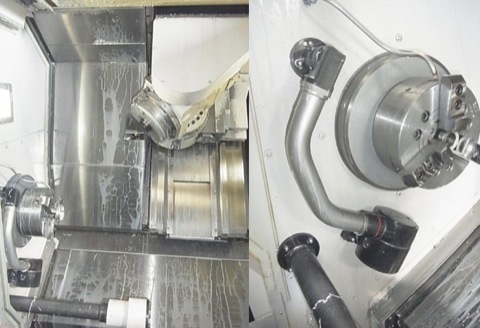 7-AXIS CNC TURNING AND MILLING CENTER. Specifications: X-axis travel 22.83", Z-axis travel 37.2", Y-axis travel 3.15", W-axis (Right spindle travel) 39.37", C-axis minimum increment 0.001", B-axis travel (Angle milling) -30 to 195. Max. swing 24.8, max. turning diamete, max. distance between spindles 35.43", Rapid traverse rate X & Z axes 1,575 IPM, rapid traverse rate Y-axis 1,024 IPM, rapid traverse rate W- axis 787 IPM. Spindle bore 2.44", Spindle nose A2-6, spindle speeds (Left & right) 38 - 5,000 RPM, spindle motor (main/sub spindle) 10 HP/5 HP, milling tooling speeds 50 - 10,000 RPM, 15 HP milling motor.